Antelope Canyon,and Lake Powell a Top 10 Adventure! 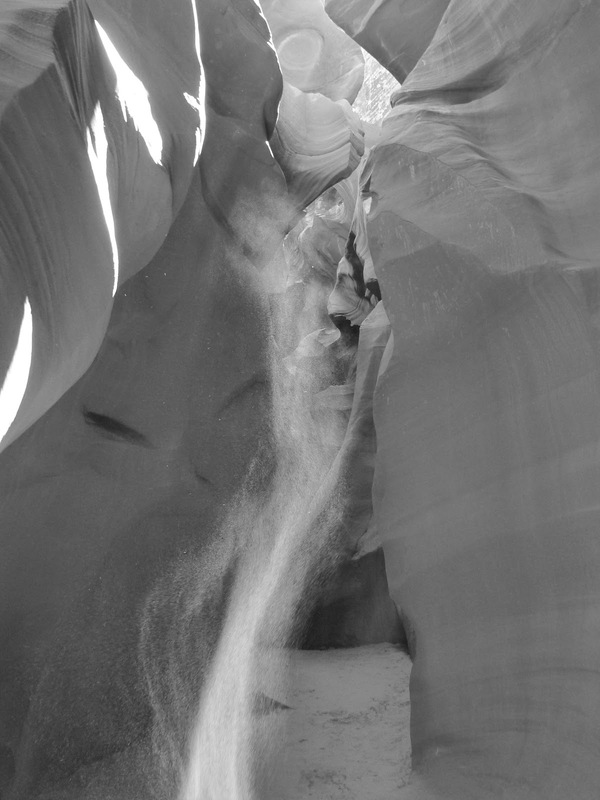 Our main reason for coming to the Page area was to visit the infamous Antelope Canyon. After reviewing the reviews and information from both Upper and Lower Antelope Canyons we chose to tour the lower through Dixie Ellis' Tours. From everything we read the tours are in vastly different types of slot canyons and we were prepared to be wowed! What we weren’t prepared for was being wowed even before got to the canyon. 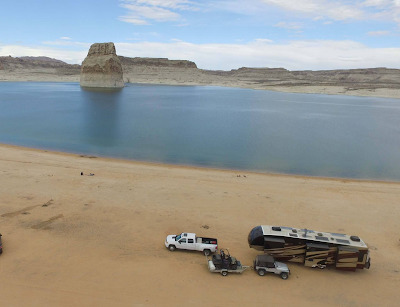 We were told by several RV friends that the Lone Rock camping area was one of their favorites and within minutes of arriving it quickly made it to our top 10 as well! We were told there was camping right on the beach or a little higher up where the views are just as spectacular. We were warned that if we did dare to take the rig down to the beach area make sure we stayed on the hard packed area or you will find yourself shelling out hundreds of dollars in towing fees. After arriving and seeing how cool the beach camping looked there was no question where we were headed! We parked the rig up top and scouted the area with the jeep picking our spot and the best route to get there. Our friends were right, stray a few feet off the hard pack and you would be axle deep before you knew it. We arrived on a Tuesday and enjoyed the afternoon on the beach. The dogs ran and swam for hours loving the freestyle beach life. With rain forecasted the next two days we scheduled our canyon tour for Friday morning. We were delighted when the sun greeted us the next morning and the rain held off for most of the day. We took advantage of it by breaking out the kayak and spending a few hours on the water. Like many reservoirs, the water was crystal clear and the shorelines were dotted with hidden inlets and canals. Having recently purchased Filmora (video editing software) I took this opportunity to create a 4 minute video of me inflating our kayak and some of our time on the water. Even with these crowds it was definitely worth seeing. No guard rails whatsoever. We were surprised to hear that the last death here was March 2010 when a Greek man fell 600' to the floor. The rain did come however and with it, the wind. The ensuing sand storm reduced visibility to about ¼ mile. I am guessing the winds were in excess of 40mph rocking the rig relentlessly. We put the dish down and spent the afternoon reading books and watching movies off the DVR. The next morning we were up early and ready for our tour of Lower Antelope Canyon! The tour itself is $25/person plus $8/person Navajo fee (plus $10 guide tip). We had chosen the 10:30am tour as everything I read said the lighting would be the best this time of morning. They ask you to arrive ½ hour early for check in. Page is located in Arizona which does not recognize daylight savings and we were camping in Utah so there was an hour difference in a matter of 10 miles. We arrived at the tour location promptly at 10am and were told we missed our tour and they follow Utah time! What?!?!? Luckily they had a couple slots for the next tour and we were good to go. Between Dixie’s and Ken’s they schedule tours every 10 minutes. The tours have anywhere from 30-45 people in each tour…..so you can imagine the number of people. As we approached the entrance to the canyon you could see people lined up waiting to get in. We waited about 30 minutes to climb down the first set of stairs into the slot. Once we got in we found ourselves in a large room with more than 100 people standing around taking pictures. This was going to be a long 1½ hours! At that point our guide (Savannah) went around to each member of our tour group (14 people) and asked if they needed any help with their cameras. This was one of my biggest concerns going into this tour, what camera settings to use. I went on line and found a lot of information on how to set your camera for the Upper Canyon Photography Tours where you can use tripods where exposures of over 6 seconds are not uncommon. Not possible in the Lower Canyon tours where tripods are not allowed. She set both our cameras to the same settings; P (Program mode) ISO 400, white balance to “Cloudy” and E/V value to -3. I will say, what initially looks like chaos toured out to be a quiet and peaceful tour. Once we left that initial room and started our tour we usually only saw the other 12 people in our tour and at times we lost them and were all by ourselves. See how narrow it gets? The exit is a VERY narrow passageway out of a crack in the rocks onto the surface.....very cool. This area around Page and Lake Powell has a lot to offer…. Hiking, boating, the tours and ATV’ing. There were trails leaving right from our camping area and Barb went for a ride into the surrounding hills to take some pictures of our camping area from above. The beach camping was great, we arrived on a Tuesday and left on Saturday. Friday night the beach got really crowded. I imagine in the summer it is a zoo! Be warned, do not get into the soft sand! There were a couple of rigs that got stuck while we were there that had to be towed out. No visit to the northeastern quadrant of Arizona is complete without a stop in Winslow. Perhaps best known for its mention in the 1972 Eagles song Take it Easy we just had to stop by to “stand on the corner”! The town itself is nothing to see. The town is long past its prime with boarded up and run down buildings lining the streets. The highlight of the town really is the one block area around the “Standin' on the Corner Park” which has some nice bars and businesses nearby. The corner itself is pretty cool with a statue of a man standing next to a lamppost and another of Glen Frey who co-wrote the song along with Jackson Browne. We had originally planned on driving right through after our photo op but when we heard friends John and Pam were spending a few nights at Homolovi State Park just outside of Winslow we just had to stop by and visit for one night. What a hidden gem this state park is! We would have never known about it had John and Pam not stopped here. There are several archaeological pueblo ruins built sometime between approximately 1260-1400. The incredible thing about these ruins was the amount of clay pottery shards in the area. Scattered among the ruins were a variety of lizards sunning themselves on the rocks. The park also has a very small cemetery containing a handful of grave sites from a Mormon settlement. It was sad to see how many of the sites were of infant children who never made it to their first birthday. 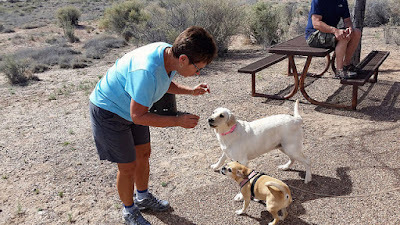 Of course Pam wasted no time spoiling Daisy and Dakota who will now look for her at every campground we stop at! Daisy and Dakota has a new best friend! The next day we moved on down the road to the Petrified Forest National Park. The Crystal Forest gift shop outside the south entrance of the park offers free dry camping so we set up there before we explored the park. We had both seen petrified wood before but never a whole forest of petrified wood! Absolutely incredible, whole trees that look like they were frozen in time. According to park information.....Over 200 million years ago, the logs washed into an ancient river system and were buried quick enough and deep enough by massive amounts of sediment and debris also carried in the water, that oxygen was cut off and decay slowed to a process that would now take centuries. The Newspaper Rock site within the park contains over 650 petroglyphs dating back 650 to 2,000 years ago. The last leg of this adventure found us driving back through Winslow towards Flagstaff where we found a great boondocking spot ( 35°10'52.78"N 111°29'42.78"W) in the Coconino National Forest just outside the gate to the Walnut Canyon National Monument. The Walnut Canyon NM is our second favorite ruin that we have visited in the last week (behind Montezuma's Castle). The Island Trail takes you by 25 dwellings occupied between 1100 and 1250AD . Although only a mile long, the park lists the hike as "strenuous" due to the elevation (~6,700 ft) and the ~350 stairs you are required to descend and ascend during the 1 mile loop. Getting this close to these dwellings was incredible. You can get a sense of what life might have been back in the day. Even more so as the sounds of crying children echoed off the canyon walls. There were even more dwellings on the opposite walls of the canyon that you could see from afar as you walked this trail. Notice the several layers of dwellings above and below each other. By the time we climbed our way back up to the Visitors Center we were huffing and puffing and ready for a few relaxing days on Lake Powell.....stay tuned!!!! Lunch with a View on Wasson Peak!!! !